With 1Home you can use more than one Smart Assistant (like Amazon Alexa or Google Home) on one 1Home Account. The setup is quick and should only take a minute or two. Before connecting the Assistants in 1Home, please make sure you've successfully configured them. Please log in to the 1Home Dashboard with your current account. If you've previously used an Amazon account for logging in and managing your devices & gateways, login with that account. 2. After you've logged in, click on your Profile in the top right corner. 3. You should see a section called "Linked Accounts". If you want to connect with your Google Assistant, please select the "Sign in with Google" button. Use the email account you've used with the Google Assistant. 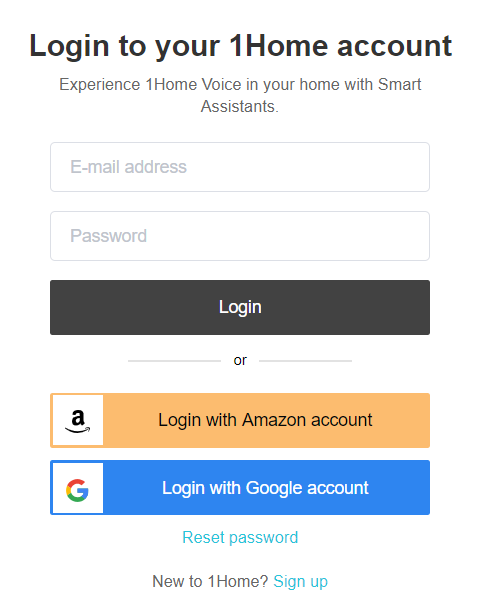 If you want to connect with your Amazon Alexa, please click "Login with Amazon". Use the email account you've used with the Amazon Alexa. 4. Please watch our Google Home Setup Video, or our Amazon Alexa Setup Video.